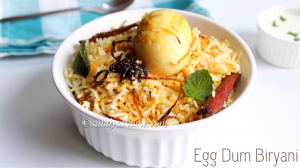 Egg biryani or Hyderabadi egg dum biryani called by any name the taste and flavors remain same and are always a feast for mouth. This style egg biryani is very flavorful and super easy to make unlike veg or chicken biryani. 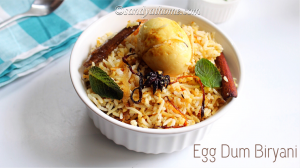 This biryani is prepared in a way where the rice is precooked to perfection and then layered over spicy and aromatic egg mixture and then the process of dum starts to infuse the flavors and taste of the spicy mixture into rice. 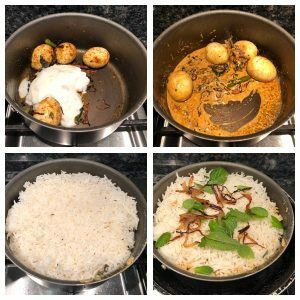 I hope I dint put the process in tough words😉 some people make biryani like street food style by tossing cooked leftover rice in spicy egg gravy but this recipe does not belong to that category. 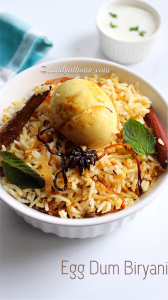 Of course this type of biryani is also tasty but we are going to learn about the later verity in upcoming post. 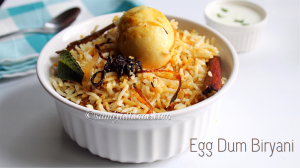 Lately I have been making a lot of egg biryani’s so we will witness all the varieties one by one soon. 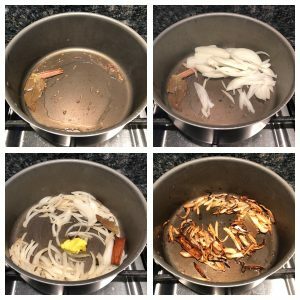 If you are beginner in cooking still waiting to make delicious yet perfect biyani then this should come handy for you. I cooked rice, eggs and gravy parallelly so it took only 30 minutes of cooking for me but if you are going to make separately one after another the time will vary. Also the whole spices mentioned below is for both rice and gravy so divide it accordingly. So let’s get to the making! 2. 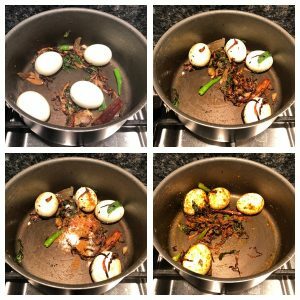 Eggs – 4 nos. In a pot add water and gently place the eggs in it. Allow it to boil well and cook the eggs. When the eggs look cooked drain the water. When the eggs are warm enough to handle deshell the eggs and keep it aside. Wash and soak basmati rice in water for 20 minutes. I soaked rice in 2 cups water. 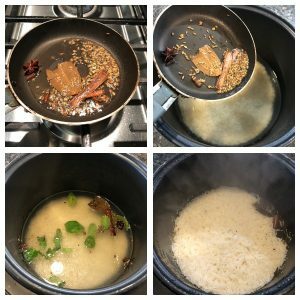 Heat oil in a small pan and add bay leaf, cloves, cinnamon stick, star anise, peppercorn and cumin seeds. When it cracks and aromatic put off the flame. Now heat oil in a pan add the remaining whole spices when aromatic add sliced onions and saute well. Saute the onions in low to medium flame till the onions caramelize or gets brown in color. Make sure not to burn it as it will change the taste of biryani to bitter. When the onions look caramelized take very little from the pan and reserve it for dum. Now to the caramelized onion add ginger garlic paste and saute until the raw smell goes then add mint and saute till they shrink. Now add boiled eggs and toss it in caramelized onions. Now add turmeric powder, chilli powder, garam masala powder, coriander powder and salt. Mix well and add curd to it. Mix it well then add the rice mixture over the egg mixture. Reduce the flame to low and trasfer the pan/ kadai onto a tawa so that the biryani is not exposed to direct flame. Now garnish the rice with few mint leaves, few fried onion and some ghee. Close it with a lid and let it dum for 15 minutes. During this time the rice will be cooked even more. Now place the biryani pan on top of a tawa and cook for 5 minutes on high flame and next 10 minutes on low flame. 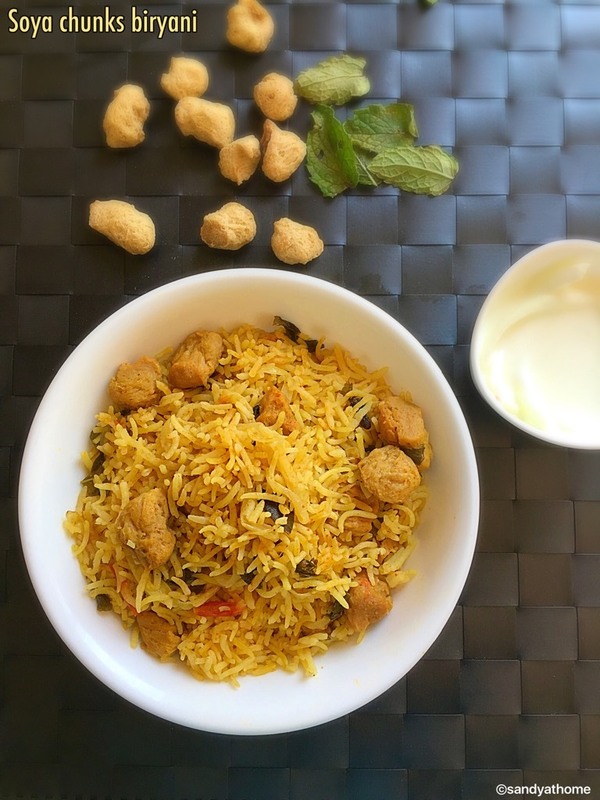 When done put off the flame and fluff the rice gently and serve it hot with raita! 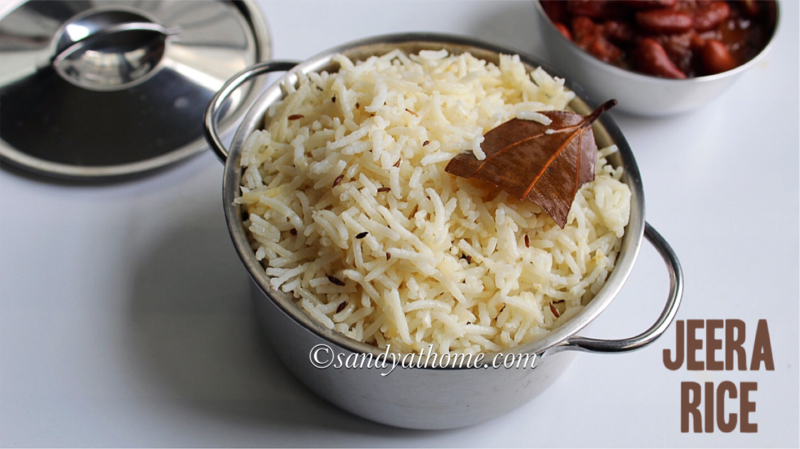 Wash and soak basmati rice in water for 20 minutes. I soaked rice in 2 cups water with which I cooked the rice as well. Now heat oil and ghee in a pan add the remaining whole spices when aromatic add sliced onions and saute well. Saute the onions in low to medium flame till the onions caramelize or gets brown in color. Make sure not to burn it as it will change the taste of biryani to bitter. When the onions look caramelized take very little from the pan and reserve it for dum. Now to the caramelized onion add mint and saute till they shrink, then add ginger garlic paste and saute until the raw smell goes. Now add boiled eggs and toss it in caramelized onions. Now add turmeric powder, chilli powder, garam masala powder, coriander powder and salt. 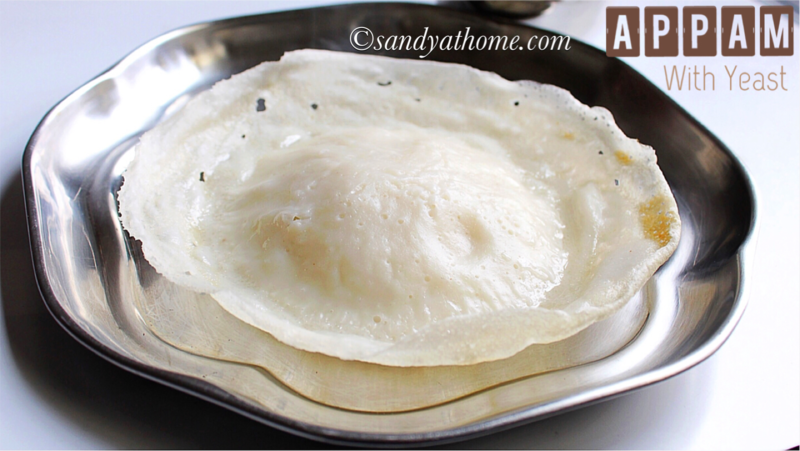 Mix well in a way that egg gets coated well in masala. and add curd to it. Mix it well then add the rice mixture over the egg mixture. Reduce the flame to low and transfer the pan/ kadai onto a tawa so that the biryani is not exposed to direct flame. Now garnish the rice with few mint leaves, few fried onion and some ghee. Close it with a lid and let it dum for 15 minutes. During this time the rice will be cooked even more. Now place the biryani pan on top of a tawa and cook for 5 minutes on high flame and next 10 minutes in low flame. 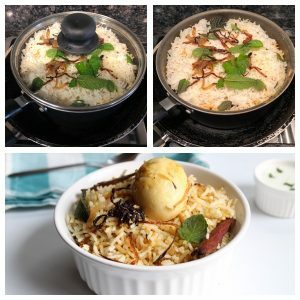 When done put off the flame and fluff the rice gently and serve it hot with raita!